Favourite Shower Gift: I know I’ve said this before, but nothing beats the Project Linus Security Blanket from Knitting for Peace as a baby shower gift. I have literally dulled a pair of needles making this blanket six times. All six are still in use, even though the oldest recipients are approaching school age. The simple, but pretty texture looks the same from both sides. It’s durable and practical, warm and cozy. I made all six in Cotton Ease, so they’re machine washable; trust me, no new parent wants to hand wash anything. 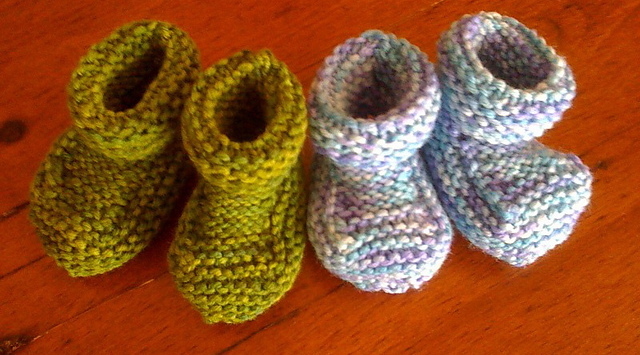 Nothing makes me a happy knitter, like seeing these get worn out as the newborn babies grow into toddlers and preschoolers. 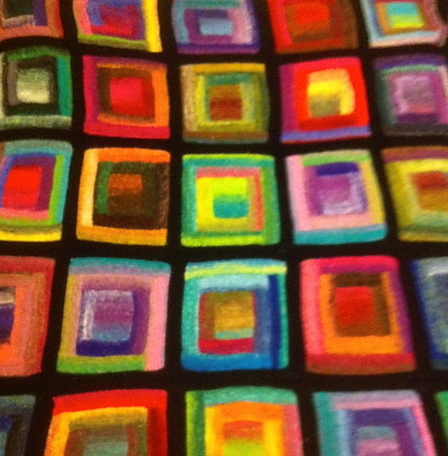 Favourite blanket: … and finally the real show stopper: The Paintbox Log Cabin Blanket. 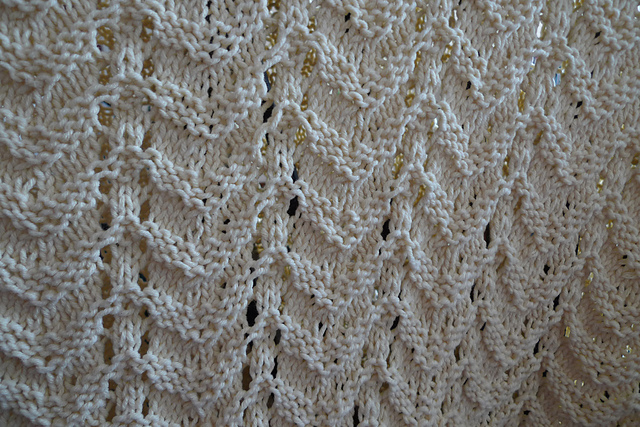 This pattern is available for free and it gave me my favourite knitting project of all. This project requires a really significant investment of time and money, and I probably won’t make it many more times. At nearly $200 worth of yarn and 4 months of knitting, it’s a once-in-a-lifetime special gift. That being said it was worth every penny and every minute. Because the blanket is constructed in squares, it was an easy project to take with me and I loved being surprised by the way the colours materialized in the Noro. It’s so beautiful and simple, I only wish I’d thought of it first. I cannot thank Katherine Keyes enough for this pattern. Spectacular. I’d love to hear your favourites. What patterns have you coming back for more? 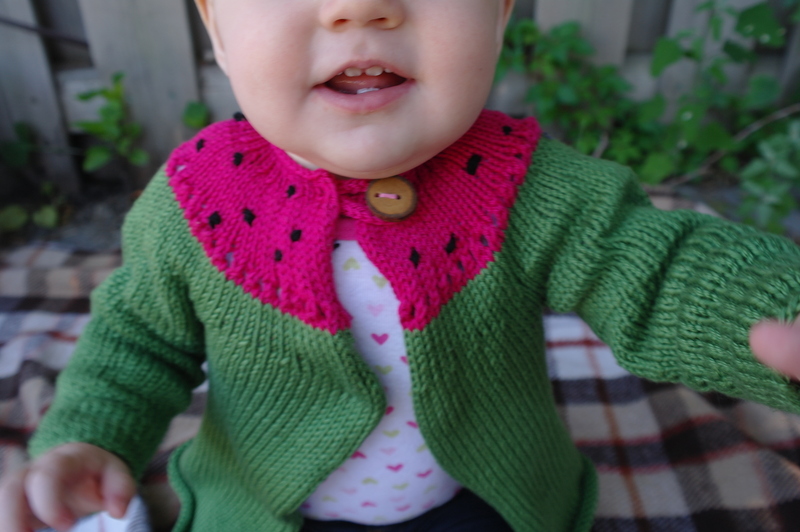 This entry was posted in Baby knits, Knitting, Sweaters, Toddler knits and tagged baby, blanket, sweater, toddler on January 31, 2013 by lisagono. What keeps us coming back to the same patterns over and over again? Certainly, a familiar pattern is always faster and usually made with more technical proficiency, but there’s more to it than that. A really great pattern demands to made over and over again. Some patterns have that perfect mix of beauty, versatility, practicality and reliability that has you coming back to them again and again. These patterns are the ones that I love to make over and over again. Favourite hat: I’ve written a few of my own hat patterns and tried countless others over the years, but the one I come back to again and again is the Dean Street Hat, which is available as a free ravelry download. The pattern comes in chunky and worsted weight and every size from toddler to large headed adult, like me. The texture has a nice density that keeps you warm. The cables are simple enough to knit swiftly but attractive enough to be special, and I’ve gotten countless compliments on the three that I’ve made. All in all a classic. 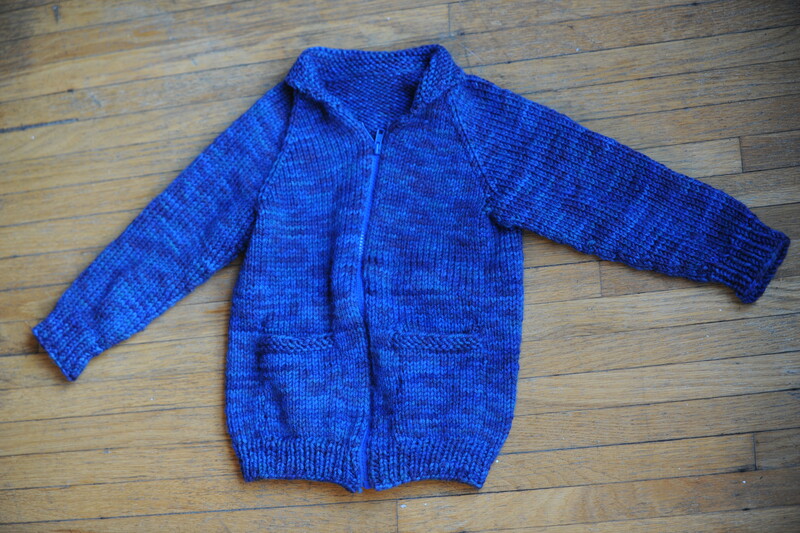 Favourite baby sweater: While my recent experience with Elizabeth Zimmerman’s Baby Sweater on Two Needles, had me second guessing this choice, Dream in Color’s Rocketry Baby Cardigan edged it out. The advantage went to the Rocketry cardigan purely on the basis of it’s unisex appeal. 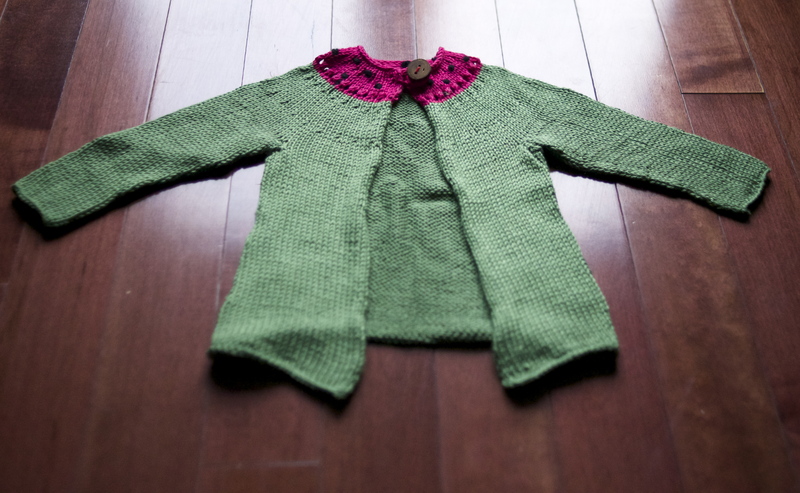 This adorable cardigan works well for boys and girls, and it’s a great stash buster. The stripes keep the knitting interesting and make ensuring uniform sleeve length a breeze. I’ve made it four times, twice in the suggested (but expensive) Dream in Color Classy, and twice in much more reasonable Lamb’s Pride wool. It’s reliable and seamless, and works equally well as a six colour rainbow sweater and in simple three colour combinations (I’ve tried pink/white/black and red/navy/white). Favourite socks: As a dedicated sock knitter this was a tough choice. Lately, I’ve worn down the spine of Cookie A’s knit.sock.love and I was tempted to choose one of her innovative designs. In the end, however, I went for simplicity: Wendy Johnson’s Gusset Heel Basic Socks, published in Socks from the Toe Up are fantastic. The directions have an admirable clarity and they are perfect for showing off multicolour yarn or as a basis for your own experiments with texture. The gusset heel is elegantly simple, providing lots of space for good fit across the top of the foot, without all of the slip stitch heel fuss. I’ve had lots of knitters look at these and ask how I made such a clever heel, if only I could take the credit. This entry was posted in Baby knits, Knitting, Socks, Sweaters and tagged baby, blanket, hat, knit, shower gift, socks, sweater on January 24, 2013 by lisagono. I just finished this shower gift for a friend who’s expecting in April, and I think this one’s about to become a staple. I’ve previously expressed my love for and fascination with seventies knitting patterns, and our recent Freaks and Geeks Netflix binge has just reignited my love of seventies knitwear. This time, I used Elizabeth Zimmerman’s Baby Sweater on Two Needles (Practically Seamless) from the February chapter of Knitter’s Almanac. 1. 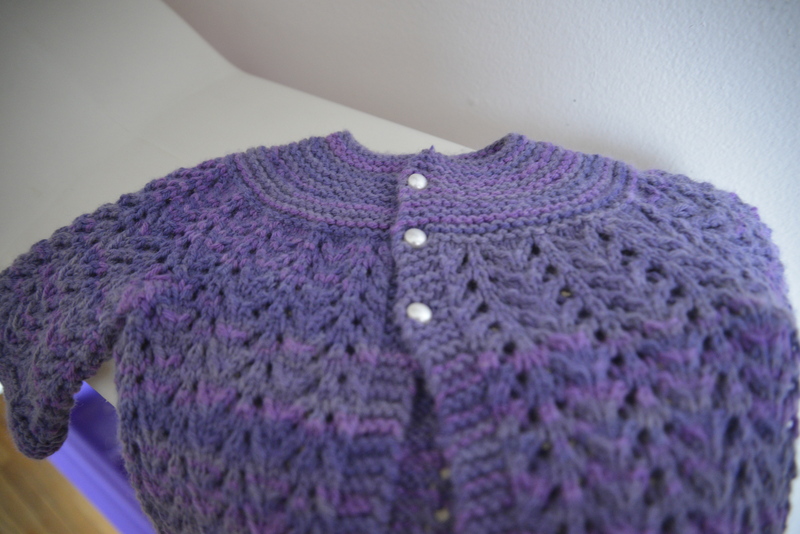 Zimmerman doesn’t mention the button holes until after she describes the yoke. You need to put button holes in while you are constructing the yoke, so read through the entire pattern carefully before you start. You can choose how many button holes to make. I looked at the 7500 (!) projects on ravelry and decided to create a swing cardigan with three buttons. 2. There are few instructions about needle size and gauge. I used size 5 needles and followed the directions regarding length exactly. The end product is a little larger than a Baby Gap 3-6 months. 3. The sleeve directions are strange. When I got to the sleeve row, I put the 28 sleeve stitches on waste yarn, cast on 14 across each gap, and then finished the body. 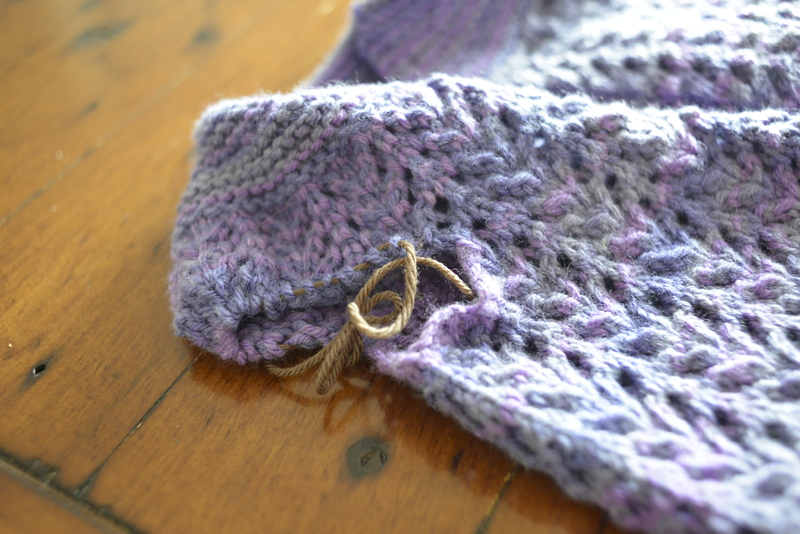 Afterwards, I returned to the sleeve, cast on 14 and knit in the round (no purling!) and then seamed the armpits. The end result is really lovely. When I make gifts before a baby is born, I am a little anxious about when they will fit the baby. You can never be sure if the recipient will give birth to a dainty 5 lbs baby or a 10 lbs baby that haunts the dreams of pregnant women everywhere. A thick sweater that baby grows into and out of over the summer months is pretty useless. The lace pattern in this sweater added to it’s appeal, since it has an all-season usefulness. I can imagine this baby wearing it on cool summer nights over a little dress or under a jacket in the spring or fall. This pattern has confirmed my love affair with Zimmerman’s timeless designs. I’m so pleasantly surprised that her books are still in print and so widely available. Has anyone discovered any other gems from the 70’s? I’d love to try them out…. 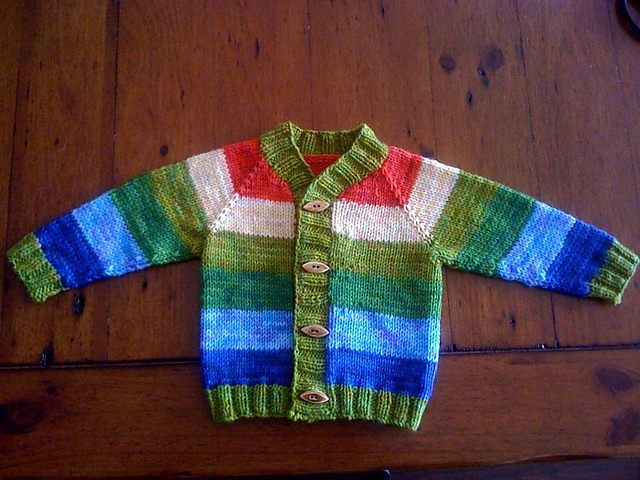 This entry was posted in Baby knits, Knitting, Retro patterns and tagged baby, Berocco Vintage, cardigan, Elizabeth Zimmerman, Retro, shower gift, sweater, yoke on January 17, 2013 by lisagono. We are still eagerly awaiting the arrival of my newest niece (although, I’m sure this waiting is hardest on my very pregnant sister-in-law.) In the mean time, I’ve been preoccupied with making sure my newest niece’s little head is warm when she finally arrives. It is a happy coincidence that my recent sock knitting binge has coincided with the pregnancies of so many friends and family, because newborn hats are the perfect way to deal with the little balls of leftover sock yarn that I have collected over the years. 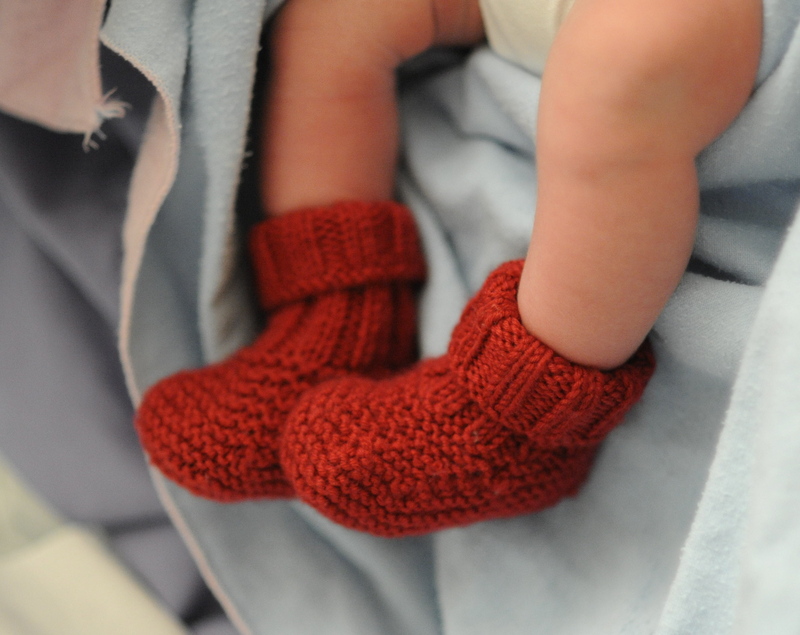 I know I have previously railed against knitting tiny impractical baby clothes, but I make an exception for these. 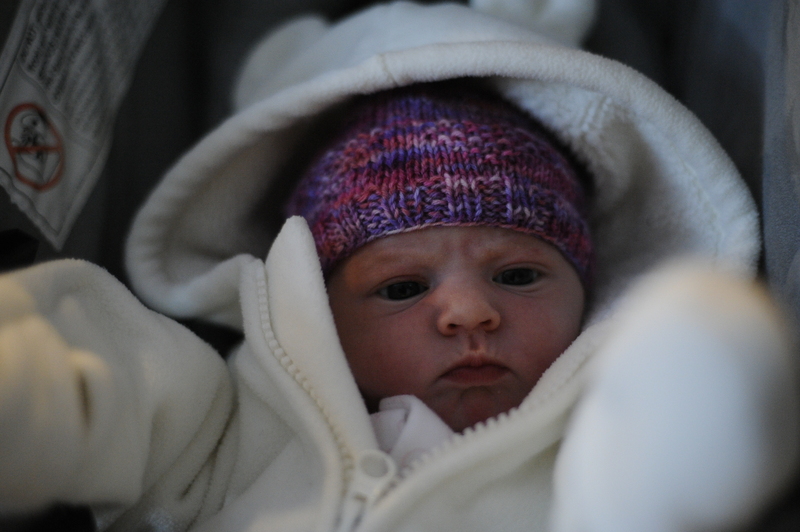 Newborn hats are quick, easy, adorable, practical (albeit very briefly) and the perfect use for leftover yarn. 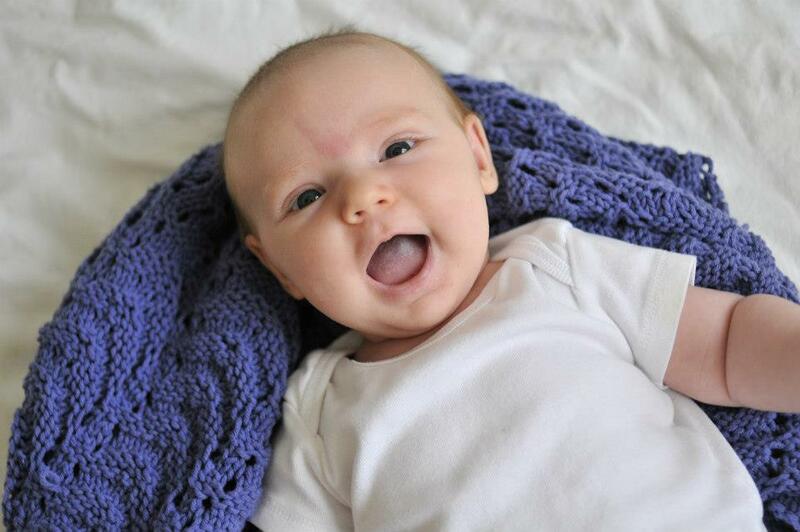 My favourite pattern for baby hats is a modified version of Carissa Knits’ Preemie Hats for Charity. These lovely little hats are simple, versatile and easy to modify. Using sport or sock weight yarn makes these hats more practical, since they are the perfect thickness for indoor or warm weather wear. 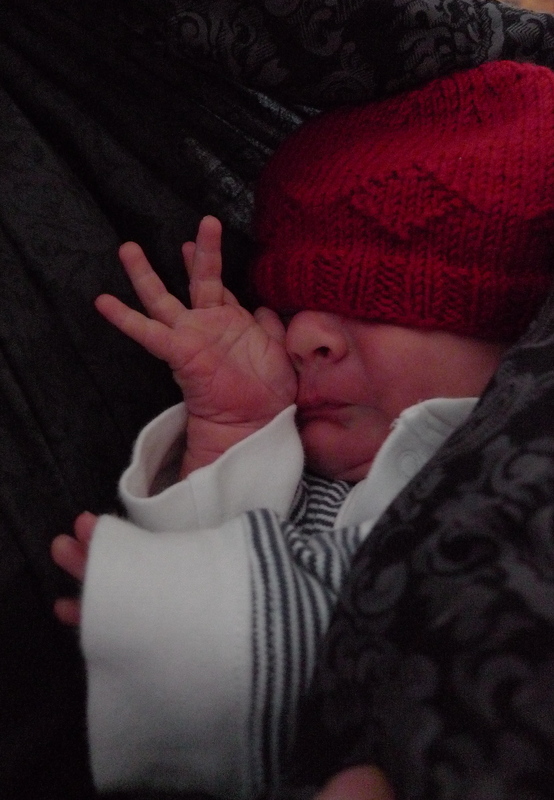 The hats are not intended for full term babies, so some changes are needed if you intend to use them as a shower gift. When in doubt, if you are making anything for a baby or small child, err on the side of big – they will always grow. 1. The ribbing is p2, k2 – so you need to cast on a multiple of four for the ribbing to work out. 2. The hearts and diamonds repeat every 12 stitches – so you will need to cast on a multiple of twelve for the texture pattern to work out. 3. The eyelets and first row of crown decreases repeats every 6 stitches – so you will need to cast on a multiple of six. Once you have carefully recorded all of the repeats, make sure that the number of stitches that you increase or decrease by matches the repeats in the original pattern. (in this instance, the original 72 sts and my 84 sts are multiples of 4, 6 and 12). be easily substituted for the hearts, eyelets and diamonds. 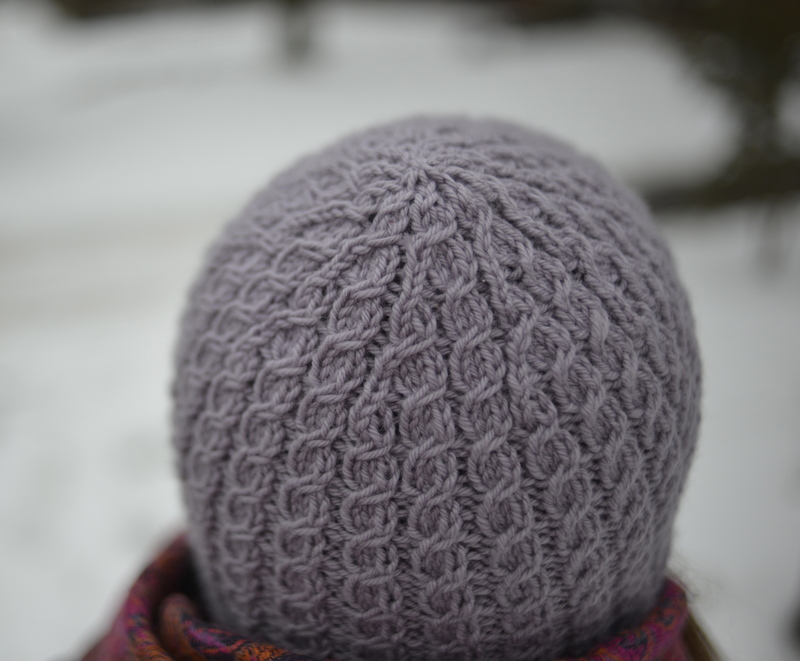 The grey hat at the top is a simple knit, purl combination that was inspired by a rug I liked. Here, I tried a basic fair isle pattern. Of course, this pattern is originally intended for donation to NICU wards. I was really moved by stories of parents recieving hand made clothes like these in the hospital. However, my basic internet search has not yielded anywhere in Ontario that accepts donations like this. If you know of anywhere, please share. I’d love to make some of these in their original size and for their original purpose. 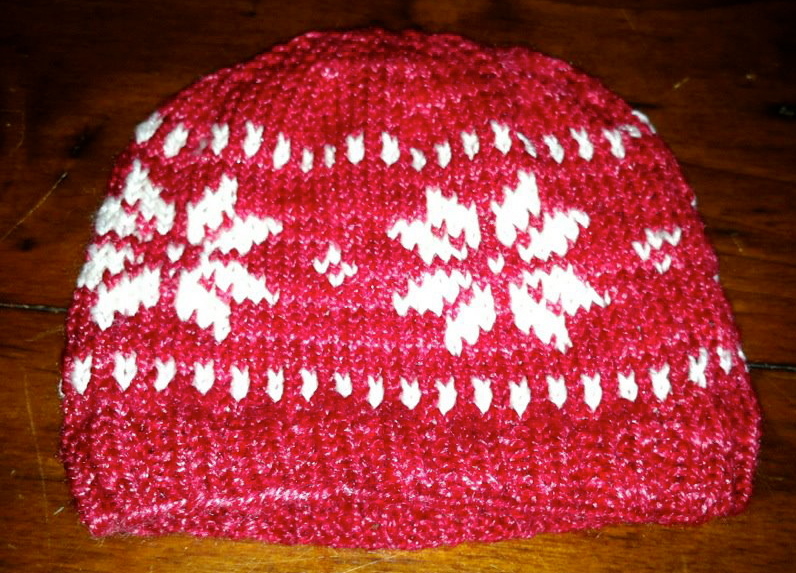 This entry was posted in Baby knits, Knitting and tagged baby, fair isle, hat, how to, modification, pattern adaptation, shower gift on November 24, 2012 by lisagono.